NORTH ATTLEBORO, Mass. 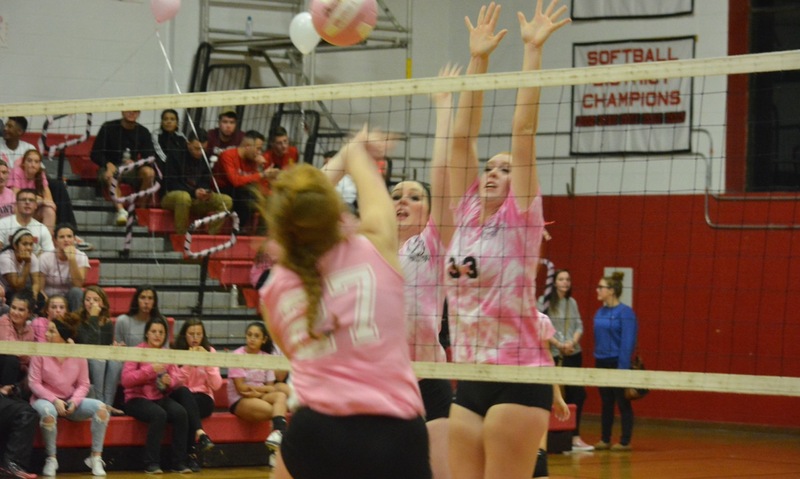 – It was senior night for North Attleboro on Tuesday night against Miflord, but the Rocketeers turned to a couple of underclassmen to lead the way. Freshman Amanda Kaiser scored a career-high 14 points (all in the first half) and junior Julia Feid scored a game-high 17 points, including nine in the fourth quarter, to pace North. Senior Julia Santos also chipped in with 14 points and 10 rebounds for the Rocketeers to propel North to a 55-45 victory over the Hawks in the Kenneth Pickering Gym. Milford was missing players to injury and school trips and star point guard Kate Irwin was only just back from missing two games to an injury as well, but the Hawks were able to take a 12-11 lead after one quarter. North picked it up in the second by turning to Kaiser. Feid (five assists) kicked it out to the freshman in the corner for a three and an 18-15 lead, she added a layup in transition (after a Feid pass over the top of the defense), and then she knocked down step-back three in the corner that put North up 26-19. Feid also knocked down a pair of threes in the second, as North caught fire from the outside. Milford kept it close by hitting from the outside as well. Julie Rabinowitz (12 points) buried a pair from beyond the arc and Irwin (team-high 15 points) hit one, but the Hawks went into the break down 29-22. Things got worse for the Hawks in the second half, as North scored the first seven points in the third and extended the lead to as many as 14. Senior Emily Haskell hit a three and assisted on a bucket by classmate Santos. Milford started to climb back in by going inside to Gillian Valanzola, who scored with a post move on the left block. The senior played almost every minute of the game and finished with, six points, 12 rebounds, and nine blocks trying to control the paint. Emily Piergustavo (11 points) knocked down a three and Rabinowitz added her third shot from beyond the arc and suddenly Milford was back in it, down just six heading to the fourth. Irwin started the fourth quarter with a three to cut the lead in half. While it got the senior to 10 points on the night, Herber credited sophomore Olivia Forbes for making it difficult for Irwin and the interior defenders for holding their own in the paint. Sophomore Julia Kleczkowski answered Irwin with a three of her own (her only points on the night) and then Feid got going. She scored off the glass in transition off a Haskell assist and then drove the ball to the basket and finished to make it 48-40. Irwin snagged a long rebound and banked in a three to keep it a five-point game with time running out but Feid went 4-for-4 from the line in the final minute to seal the win. North Attleboro (4-13, 3-12) will try close out league play with a win on Friday against league champion Foxboro. Milford (11-8, 7-8) will close out the regular season against Sharon as it tries to build momentum for the playoffs. MILFORD, Mass. – Heading into halftime of Tuesday night’s game at Milford High, the Hawks seemed on the verge of an upset over Kelley-Rex division leader Mansfield, but a collision in the final minute of the second quarter proved to be the game’s decisive moment and sparked a big second half comeback for the Hornets. Senior point guard Kate Irwin, who had been held to five points and two assists in the first half, but who drew most of the attention from the Mansfield defense, collided with Mady Bendanillo and landed hard. Irwin could not return and the Hornets were able to take advantage. Mansfield ran off 22 unanswered points in the third quarter to not only take the lead but also take control of the game on the way to a 53-40 victory that keeps the Hornets in front by two games in the league standings. With the Hornets mixing things up on defense and keying on Irwin, trying to keep the ball out of her hands, other Milford players needed to step up. Juliana Tracy scored all five of her points in the first, knocking down a three and scoring on a rebound, and Jess Tomaso drove to the hoop for two. Mansfield would hold a 14-10 lead after the first thanks to senior center Meg Hill (17 points and 10 rebounds). She scored the Hornets’ first six points and, as the Hawks sank down on the paint, Emily Vigeant and Ann Maher (six points) drilled threes. In the second quarter, Milford made the Hornets pay for giving so much attention to Irwin. 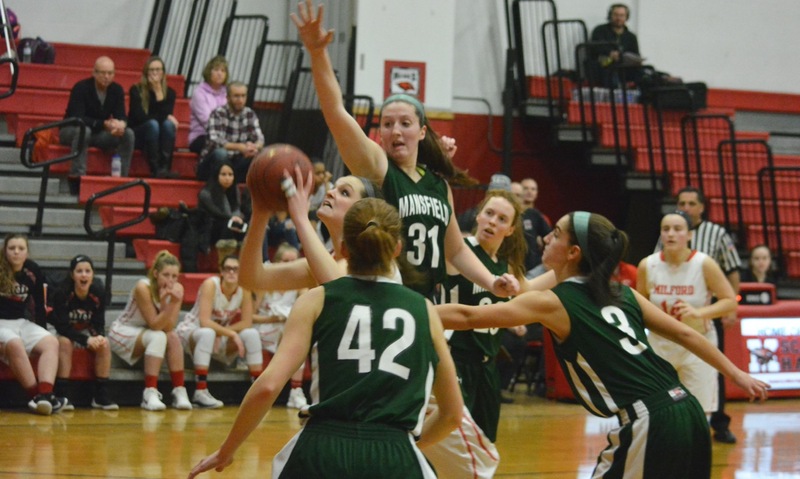 After a jumper by Maggie Danehy (eight points and 10 rebounds) put Mansfield up by seven, the Hawks started to click. Piergustavo knocked down a pull-up jumper, Gillian Valanzola drove to the basket for two points, and Julie Rabinowitz drilled a three to cut the lead to two. Piergustavo nailed her second three of the game to give Milford its first lead at 23-22, as part of a 13-0 run to close the half. Valanzola got free on another drive and Irwin caught Mansfield with a back cut and layup and Piergustavo closed the quarter with another three. Coming out of halftime, Irwin was forced to the bench holding an ice pack and the Hawks never recovered. Mansfield turned things around, locking down on defense and shutting out Milford in the quarter, while finally getting the offense in gear. Maher hit a three to cut the lead to a single point and then the Hornets took back the lead after Vigeant tracked down a rebound and assisted on a Hill basket. Bendanillo added four points in the third and Sydney Mulkern came off the bench to score nine points on three shots from beyond the arc to push the lead to 14 (44-30) heading into the fourth. The Hawks struggled without their point guard in the third, but Dolliver credited his team for not allowing the game to get out-of-hand and pushing back in the fourth. Milford cut the lead to 12, but Danehy scored on an offensive rebound and Hill drained a jumper. Rabinowitz nailed her second three and Tomaso (six points) scored with a baseline drive, before Piergustavo (14 points) ended with her fourth three. Mansfield (12-4, 10-1) will get back into division play on Friday when it hosts Taunton. Milford (10-5, 6-5) will try to hold onto second in the Davenport when it faces Stoughton. MILFORD, Mass. – Holding onto a seven-point lead with a little more than a minute remaining in Tuesday night’s game against Davenport division rival Canton, Milford moved the ball around the perimeter to run clock. Despite the pressure from the Canton guards, the Hawks were able to keep the ball moving until it got to senior guard Kate Irwin on the left wing. The lefty point guard took two hard dribbles to get space and pulled up from just inside the three-point line. Irwin got a clean look and hit nothing but net on the last of her game-high 26 points, 17 of which came in the second half. Irwin’s jumper effectively sealed a 49-38 victory for the Hawks, who move into a tie with the Bulldogs for second place in the division ahead of the visit of league leading Foxboro on Friday. Irwin had only two points in the first quarter, as Canton junior Maggie Connolly made her work for every shot. The imposing figures of 6-foot-3 Erin Devine and 6-foot-1 Hannah Jerrier in the paint also made it difficult to find good looks at the rim. Senior guard Emily Piergustavo picked up the slack for the Hawks in the first with seven of her nine points, including a a three and a basket from an offensive rebound. Devine led the Bulldogs with four and it was a three-point edge for the Hawks heading to the second. That was when Irwin started to catch fire. She opened the second with a traditional three-point play off a steal, scored off a Piergustavo offensive rebound and assist and then got another steal and transition basket. Canton continued to keep the game close, despite only getting four points from Jerrier. The team’s leading scorer was blanketed by Milford’s 2-3 zone with all of the Hawks making sure to know where the senior was at all times. The zone opened up opportunities from the outside and junior guard Julia Hamilton (nine points) made a pair of threes, the second of which tied the score at 24-24 in the third quarter. “We get into a lot of situations where we defer to the bigs because they’re talented and it’s part of our game plan to utilize them, so it’s nice to have Julia do one of the things she’s good at and help our team get us ahead in that area,” said Canton coach Jim Choquette. Jerrier (10 points and 11 rebounds) scored off a Connolly assist to give the Bulldogs a 26-24 lead, but Milford went on a 9-2 run to finish the third with a five-point advantage. Irwin scored eight of those final nine points, hitting a pair of pull-up jumpers and scoring twice off of steals. The game remained tight in the fourth quarter. Jerrier scored on a putback to start the fourth, but Gillian Valanzola scored off an Irwin assist to answer. Hamilton got the ball into Devine for a basket at the rim and, after Jess Tomaso scored to push the lead back to four, Molly Ludwig scored off another Hamilton assist to make it 37-35. Again, the Hawks were able to close a quarter strongly. Kate Lobisser rattled in her only basket of the night to get the run started and Irwin added three more with a finish, plus the contact, following a steal. After the teams traded a series of free throws, Irwin got open in the corner and hit the dagger jumper to ensure the win. Milford’s ability to compete with Canton’s size on the glass was also a factor in limiting the Bulldog’s offense. Tomaso and Valanzola each finished with six rebounds, while Irwin and Juliana Tracy each finished with five. Milford (5-2, 3-2) will host league leading Foxboro on Friday night. Canton (4-2, 3-2) will be back home on Friday to face Sharon. The Bombardiers enter the season with a new coaching staff and a very different starting lineup to the one that nearly knocked off Mansfield in the Div. 1 South playoffs last season. Former King Philip coach Marty Crowley has taken over after Rick Patch stepped down in the off-season and he will have only a few returning varsity players to call on this winter. Senior forward Sam Pierce will be the key piece on offense, as Attleboro tries to replace the more than 30 points per game that was lost with the graduation of Sarah Deyo and Julia Strachan. Pierce has been a consistent scorer and rebounder for the past few seasons, but this will be the first time that she is the primary offensive weapon and could be poised for a breakout year. Junior Jordyn Lako and senior Grace Mayer are strong on-the-ball defenders and should help Crowley implement his high-pressure defensive scheme. Senior Kim White will also be one of Attleboro’s ball-handlers in the backcourt. One of the players who saw a little time on varsity last season that is expected to make a big jump is sophomore Nyah Thomas, who has the length to be a tough defender and showed in her few appearances last year that she can rebound and take the ball to the basket. Sophomore Liv McCall is a fearless shooter that will stretch the floor and transfer Mackenzie Roberts will give the Bombardiers added size in the paint. There has been excitement around the Canton program for the past few seasons and that continues this winter, as the Bulldogs look to secure a place in the state tournament behind an experienced lineup that has been developing together for several years. Senior Hannah Jerrier is the key for the Bulldogs, as the forward is coming off a league all-star season in which she emerged as a potential double-double night after night. Jerrier is a solid rebounder and scorer in the paint, reaching the 20-point mark nine times last season and averaging more than 16 points and nine rebounds per game. Junior Julia Hamilton will be back at point guard for the Bulldogs to help get the Canton into its offensive sets and provide pressure, on-the-ball defense. Senior Jess Powers is also back after missing a season to a knee injury and will add a boost to the team’s outside shooting and take pressure off Jerrier on offense. Junior Maggie Connolly returns for her second year in the backcourt and seniors Lindsey Barrett, Nikki Gefteas, and Leya Conard will all add depth to the Canton roster this season, while junior Erin Devine adds another important post presence on both ends of the floor. The versatility of the roster will allow head coach Jim Choquette to change his game plans every game, slowing it down to play half-court or ratcheting up the pressure to go up tempo. After winning the Div. 2 South title and reaching the TD Garden last winter, this year’s Foxboro team will have high expectations, but with four starters returning, including reigning Hockomock League MVP Ashley Sampson, the Warriors will once again be the favorites to take home the Davenport division crown. Having already passed the 1,000-point mark for her career, Sampson enters her senior season as the focal point of the Foxboro offense. Her ability to get into the lane and finish, as well as step back and knock down shots, makes her a tough cover and opens space for her teammates. Fellow senior Lily Sykes is one of the beneficiaries of that space and she can take advantage of open looks on the perimeter. Senior Grace Tamulionis is another player who can stretch the floor for the Warriors and can be an ‘X’ factor for Foxboro in big games. Senior Shannon Smally adds rebounding and post presence to keep defenses honest. The Warriors are now the veteran team in the division, but there are also several younger players that have developed into critical pieces off the bench, including sophomore Abby Hassman, who has grown in the off-season into a strong rebounder. Freshman Katelyn Mollica will add backcourt depth with her tenacity on defense and already impressive court awareness. Junior Chelsea Gibbons is another player that is expected to step into a bigger role this season. Franklin got off to a rough start last season, beginning 0-6 with an inexperienced roster, but then closed the year with nine wins in the last 14 games, just missing out on a return to the postseason. This year, the Panthers will try to build on that year of experience and book a return to the playoffs. The Panthers will have strength in the middle to try and get off to a much better start this season. Sophomore Ali Brigham, last year’s HockomockSports.com Underclassman of the Year, has received several Div. I NCAA offers, including one from the University of Minnesota, and at 6-foot-3 can dominate the paint on both ends of the floor. Franklin will also have outside scoring with junior guard Bea Bondhus, who is a consistent three-point shooter and will stretch defenses to open up the post for Brigham. Franklin has plenty of size this season. Sophomore forwards Breanna Atwood (5-foot-9) and Megan O’Connell (5-foot-10) and senior forward Kate Morse (5-foot-11) will provide plenty of depth on the inside. Junior Shannon Gray will be back to run the point and senior Grace Sameski will add backcourt depth. Freshman guard Elizabeth Wilson is poised to make an instant impact for the Panthers, as she did in the season opener by knocking down three free throws in the final seconds to force overtime against Holy Name. “We are a young team with only two seniors, but I am very pleased with the effort and progress of the team,” said Franklin coach John Leighton, who is excited about the return of the majority of the team’s scoring and the potential of the youth on the roster. King Philip has a new coach this season, with former Wellesley assistant Amy Siggens taking over for Marty Crowley, and there could be a period of adjustment for a still relatively young Warriors roster to adapt to the new system, but there is excitement about the progress being made by the seven returning varsity players. Boston University-commit Shannon O’Connor will once again be a player to watch for the Warriors this winter. The junior’s ability to shoot off the dribble, defend multiple positions, and take the ball to the basket has made her one of the league’s elite perimeter players. As O’Connor continues to develop as a playmaker that will create open looks for her teammates, including junior Julia Leroux and sophomore Faith Roy. Senior Christina Hathaway (one of only two seniors on the roster) will add strength in the paint on both ends of the floor. The Warriors will not lack for size this season. O’Connor is listed at 5-foot-11, junior Catherine Cummings and sophomore Faye Veilleux are listed at 5-foot-10, and Roy is listed at 5-foot-9. The versatility of those players will give Siggens room to switch up lineups when needed. KP is still pretty young and Siggens has added two freshmen, Emma Glaser and Brianna James, to this year’s roster. 2016-2017 Finish: Reached Div. 1 South final. Replacing the production of last season’s HockomockSports.com Player of the Year Jen Peel is a difficult task, but Mansfield has the talent, depth, and experience in the roster to make it work. The Hornets return four starters from last year’s squad and will lean on a loaded and versatile junior class to try and make it a three-peat of league titles. The key returner for Mansfield is 6-foot-3 center Meg Hill. The Stonehill College-commit is already the program’s best in blocked shots and is soon to be the career leader in rebounds, while improving her offensive game every season. With Peel gone, junior Mady Bendanillo will be tasked with getting the ball into the post to Hill and to fellow junior Maggie Danehy, who had an impressive start with a double-double against Medfield in the Endowment Game. Reigning HockomockSports.com Defensive Player of the Year Ann Maher will also be back at shooting guard and is one of the team’s most consistent three-point threats. Juniors Erin Daniel, Emily Vigeant, Sydney Mulkern and Kara Bendanillo will likely compete for the fifth starting spot and all should see plenty of playing time this year. With 5-foot-11 senior Maeve Carney and 5-foot-10 freshman Ashley Santos, the Hornets should be able to dominate the paint and sophomore Becca Hottleman will add depth at the point guard position. 2016-2017 Finish: Reached Div. 2 Central first round. A year after returning to the postseason for the first time since 2012 (and nearly pulling off an upset of Marlboro on the road), Milford brings back seven seniors to try and make a push for a Davenport division title and another state tournament appearance. The Hawks have a versatile lineup led by four-year starter Kate Irwin. The lefty point guard is one of the most dynamic perimeter scorers and playmakers in the league and she continues to improve each season. Her ability to get into the paint opens up room for her teammates and she can also step back and knock down threes. Irwin will be helped by fellow seniors Gillian Valanzola and Juliana Tracy, who add size on the post. Senior Emily Piergustavo is a knock-down shooter from beyond the arc and her classmate Jess Tomaso has proven to be a solid rebounder from the guard position. There are also two sophomores and four freshmen on the roster this season to add depth and build for the future under third-year head coach T.J. Dolliver. 2016-2017 Finish: Reached Div. 2 South Quarterfinal. Last season, North Attleboro boasted one of the most experienced lineups in the league with five of its top six players being seniors, but this year the Rocketeers will be incorporating a number of new faces, as only six players (only starter) return from last winter. The lone returning starter is junior guard Julia Feid, who had a breakout season on the wing and will be counted on to lead the offensive attack this year. Feid’s classmate Emily Haskell will also be on the wing for North this season and will also have a large chunk of the offense run through her. Senior Emily Pastore, junior Liz Smahi, and sophomore Michelle Pothier will also contribute scoring from the wing, while junior Lauren Pezzi and sophomore Olivia Forbes will run the point and distribute the ball in the half court. The graduation of Caroline Collard and Liz Morehouse leaves an opening on the post, but North has several players that will step in to provide a presence in the paint. Senior Julia Santos and juniors Emma Noreck and Kaley Sullivan will each get opportunities to contribute. North faces a tough early season schedule with the likes of Franklin, Oliver Ames, Archbishop Williams, and Hingham, so it will be critical for the new players to find their feet quickly. 2016-2017 Finish: Reached Div. 2 South First Round. Oliver Ames struggled to find consistent offense last season and it kept the Tigers from being able to challenge Mansfield for the league title or make another run in Div. 2 South, but a healthy lineup with several key returning players has OA optimistic for improvements this winter. The main focus will be on senior forward Kayla Raymond. The Stonehill College-commit is one of the most versatile players in the league, with the length and leaping ability to dominate in the paint and the range to step out and knock down jumpers. Raymond is listed as a forward/center but could potentially be used at multiple positions. Senior guard Abby Reardon is back to get the Tigers into their offensive sets and as one of the league’s top on-the-ball defenders. Classmate Katie Flynn also returns to give Raymond help in the post. In addition to the seniors, junior Alex Sheldon will provide depth at the forward position and junior Sadie Homer was a dynamic scorer on the perimeter before an injury cut her season short last year. Homer was a solid three-point shooter last year and will be expected to stretch defenses again this season. Sophomore guard Meg Holleran emerged as a playmaker during her freshman campaign and could see a bigger role this year. In addition to a new coaching staff, Sharon will see a number of new faces on the roster, as several of last year’s players are focusing on other sports this winter. Former Rockland and East Bridgewater assistant Sandra Lombardi takes over for Cliff Tomassian and will have a young group to work with in her first head coaching position. Junior small forward Emma Eberhardt is one of the returning players that will be expected to provide leadership and scoring for the Eagles. Eberhardt, a HockomockSports.com All-Underclassman Team performer last year, was Sharon’s top scorer last winter and also has the size to be a problem for opponents on the glass. She scored 16 points in Sharon’s win over Nipmuc in the season opener. 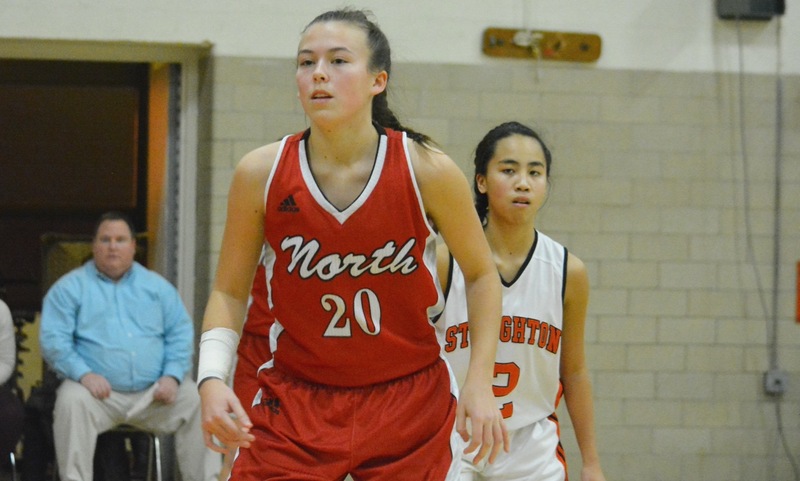 Senior guard Miranda Cheung will also be back for Sharon to provide ball-handling and perimeter shooting. Sophomore Telishya Herbert made the jump from JV to varsity midway through last season and had an instant impact on the Eagles with her athleticism and her ability to score in the paint. She had 10 points against Nipmuc and could be ready for a breakout year as Sharon’s second scorer to take some pressure off Eberhardt. Also back from last year’s roster are junior Evanjuline Elisma and sophomore Ally Brown. The Black Knights narrowly missed out on the postseason last year, despite having a number of underclassmen in the roster, and expectations for this season include a return to the playoffs under third-year head coach Charmaine Steele-Jordan. Senior Val Whalen was the team’s MVP last season after leading the Black Knights with more than 13 points and nine rebounds per game. Whalen has improved every season and her intensity on defense and on the glass boosts is contagious. 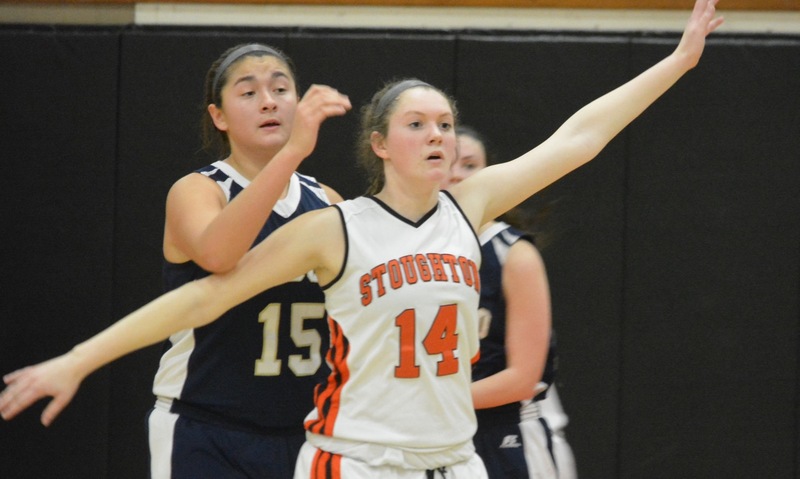 Stoughton is a physical team that likes to put pressure on the ball defensively and Whalen sets the tone. Senior Jordan Motley is also a tenacious rebounder and gives the Black Knights another strong presence in the paint. Sophomore guard Shyanne Trinh had a breakout freshman campaign, scoring more than 10 points per game, and her ball-handling and long-range shooting opens things up for the post players. Fellow sophomore Aliyah Wright also had a strong rookie campaign and her size is a difficult matchup for many of the point guards in the Hock. Stoughton will also count on junior guards Lindsey McDonald and Hailey Egan and sophomore Lexi Baptista. Freshman Sydnee Hyacinthe has also been called up to add depth in the backcourt. Taunton is coming off a difficult season in which the Tigers finished with just one victory, but one game into the new year and Taunton has already matched that total. The season opening win over Cumberland (R.I.) fits with the optimism around the program, as the Tigers blend youth with experience in the hopes of making a run at a playoff spot. The Tigers will be led by senior forwards Hannah Moniz and Mackenzie Handrahan, who combined for 26 points in the win at Cumberland and provide a mix of rebounding, scoring at the rim, and outside shooting to balance the Taunton offense. Junior Lily Patneaude also returns from an all-star season and is Taunton’s most dynamic scorer with range from well beyond the arc. Junior Alexa White is another guard that will provide solid contributions on both ends of the floor. Junior Shantel Andrew, a 5-foot-7 forward, is expected to be a significant contributor this season, after missing two years with knee injuries. As usual, Taunton has plenty of youth on the roster with four freshmen making varsity, a couple of whom got playing experience last year as eighth graders. Forwards Jaelyn and Sonya Fernandez and guards Kelsey White and Tori DaRosa are going to be counted on to play big roles this year for the Tigers. NORTH ATTLEBORO, Mass. – North Attleboro was trailing by a point as the clock wound down under 90 seconds remaining in Tuesday’s game at the Kenneth Pickering Gym. The Rocketeers needed someone to make a play to avoid the upset against an upstart Milford team that was trying to tie North for the Davenport division lead. Senior Ashley Ahern picked the pocket of Jill Burley, her fifth steal of the game, and raced the length of the court for a layup to give North a 46-45 lead. It turned out to be the game-winning basket, as the Rocketeers locked down on defense and Ahern sealed the 51-45 victory by knocking down 5-of-6 free throws. It was an impressive come from behind win for the hosts, who trailed by as many as 10 points in the third quarter, but also an indication of how far Milford has come in head coach T.J. Dolliver’s second season that the Hawks had the division leaders on the ropes. “They did,” replied North coach Derek Herber about Milford having the Rocketeers on the edge. “We’ve seen enough of them…I told my girls that they’re scrappy like us and they can shoot a little bit, so we’ve got to be ready to play. They came out right away and did exactly that. The opening quarter was an indication of the confidence that the Hawks are playing with this season. In an end-to-end period that resembled a track meet as much as a basketball game, the Hawks got points from six different players and scored 19 points. Christine Pye (eight points) knocked down a pair of long jumpers and Burley scored four of her eight points on a pair of runners in the lane. Nicole Dahlgren (12 points, eight rebounds, five assists) scored on an offensive rebound plus the foul then assisted on a three-pointer by Juliana Tracy. North kept it close in the opening quarter with a strong offensive attack of its own. Ahern scored four of her game-high 16 points and sophomore Julia Feid added six of her seven points in the first. The pace continued in the second quarter, but the scoring slowed down. The teams scored six points apiece and headed into halftime with the Hawks ahead 25-21. In the third quarter, Milford came out strong and took a double digit lead. Kate Irwin flipped a pass over the defense to Dahlgren for a layup then Gillian Valanzola used a pump fake to get past Caroline Collard in the post for a basket. After Dahlgren scored on one of Burley’s six assists, she then managed to keep a play alive while falling to set up Irwin (six points) for a three. North trailed 36-26 and Herber called timeout. Feid snagged a rebound of a missed free throw and fed it to Collard for a layup to get North started. Collard then scored a layup in transition off an Ahern assist and another off of a Feid inbound pass to get the Rocketeers back within three. Collard scored 10 of her game-high 16 in the quarter. North regained the lead before the end of the third on back-to-back steals and transition baskets by Ahern. Dolliver was left rueing the missed opportunity to put North away. North extended the run to 13 straight points with a pair of free throws and then Samantha Taggart answered a Dahlgren jumper with a three-pointer that made it 42-38. Pye scored on a layup to cut the lead in half, but Liz Morehouse scored her only points of the night to push the lead back to four. Pye was left open on an inbounds play for a layup and then Dahlgren buried a straightaway three-pointer that put Milford back in front by a point with time running out for North. The North defense was aggressive throughout the second half with Ahern causing problems for Burley and Emily Schromm holding Irwin, who currently leads the Hockomock in scoring, to just six points. It was Ahern who made the biggest play, turning the game around for North when it needed a stop and scoring the final seven points of the game. North Attleboro (9-2, 6-0) will continue a tough stretch when it hosts Foxboro on Friday in another game against a team that is one game back in the division. Milford (6-2, 4-2) will have no time to dwell on the loss, as the Hawks host Hopedale on Wednesday. The Bulldogs continue to add to the program both on the court and on the bench with former Canton and UMass Boston star Olivia Murphy joining the coaching staff this season to help out with the freshman team. It is a sign of the continued growth of the program under head coach Jim Choquette, who is hoping that the momentum built at the end of last season will carry over to this year. Senior forward Emma Murphy returns after a league all-star season and will be joined on the front line by returning starters senior Casey Shea and juniorHannah Jerrier, who was an honorable mention for all-star last winter. Adding depth on the front line will be sophomore forwards Molly Ludwig and Erin Devine, who lacks inexperience but adds significant height. Jess Powers is recovering from an injury suffered during lacrosse season and her return will add more scoring punch to a deep and quick backcourt group. Sophomore Julia Hamilton is back to run the point for the Bulldogs and will be joined by classmate Maggie Connolly, junior Lindsey Barrett, senior Taylor Carrington, and junior twins Lillian and Evelyn Carrington. This group will allow Canton to keep defensive pressure high all game long. Despite a lot of youth in the lineup, Foxboro has been one of the top teams in the Davenport division for several seasons and this year should be no different, as the Warriors enter the winter with very high expectations and as one of the favorites for the league title. A lot of the interest in the Warriors stems from the continued development of junior point guard Ashley Sampson, who has turned into one of the best all-around guards in the Hockomock and is the player that the Foxboro offense flows through. Sampson has plenty of help in the backcourt with classmate Lily Sykes, who offers scoring from the perimeter, and seniors Lauren Flahive, Riley Collins (back after an injury), and Hailey Maling, who are all strong on the ball defenders. In the front court, Kristen Bortolotti is back after missing last year with an injury and will add speed and a strong mid-range game. Junior Grace Tamulionis is another matchup nightmare for the opposition with her size on the boards and on defense and her ability to step outside and shoot the three. Junior Shannon Smally continues to improve and gives the Warriors an inside presence, while newcomers Chelsea Gibbons and Abby Hassmancould make big contributions for the Warriors. After missing out on a playoff spot by one game a season ago under first-year head coach T.J. Dolliver, Milford enters this winter with high hopes of making the leap into the postseason with a deep and versatile roster that has gained a lot of experience together over the past few seasons. The enthusiasm for the Hawks begins with dynamic junior point guard Kate Irwin, who has shown the ability to get to the basket at will, draw defenses to get open looks for her teammates and also be a pesky on the ball defender. With Irwin creating open shots, junior Emily Piergustavo’s return after missing last year with an injury will be a big boost on the perimeter along with senior guard Jill Burley. Milford will also have plenty of players to contribute on the glass and in the paint. Senior Nicole Dahlgren, a two-year captain, is a strong rebounder but can also step out and hit threes as can junior Jess Tomaso. Five-foot-8 senior Christine Pye, 5-foot-11 junior Gillian Valanzola, 5-foot-8 senior Emma Liskov, and 5-foot-10 Juliana Tracy give Milford an imposing group of front line players. The Rocketeers head into their first season in the Davenport division with eight returning players from last year’s team that was two points away from a first round victory in the Div. 2 South tournament against Hock rival Oliver Ames. Senior Ashley Ahern is a three-year starter at guard and was the team’s leading scorer last winter. Ahern will be the player that gets the offense going, but she will get plenty of help from her classmates, Emily Schromm and Samantha Taggart. Schromm was one of the top defenders in the league and can stretch a defense with her outside shooting and Taggart can play all three guard positions and led North in assists last year. In the paint, senior Caroline Collard is the team’s leading rebounder and showed a soft touch around the basket. 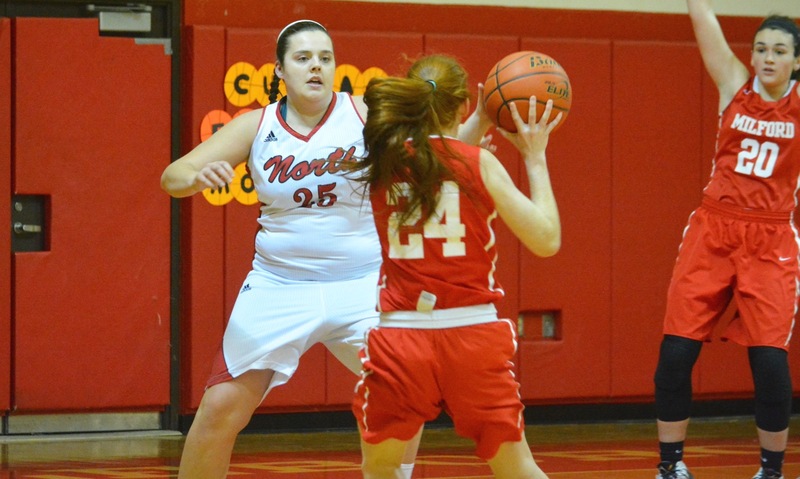 North can also look for improvements from sophomore Julia Feid, who got valuable minutes as a rookie last year, senior Liz Morehouse, who adds depth in the post, and juniors Julia Santos, who both brought athleticism off the bench at the wing positions. Sophomore forward Mackenzie Roberts is a newcomer who adds size and outside shooting and junior Emily Pastore can step in at all three guard positions. Sharon is another team that has been building with youth and has created a lot of depth on its roster and, despite losing three of its top four scorers from last winter, has garnered preseason hype as a potential sleeper to make a return to the postseason for the first time since the Eagles made a run to the Div. 2 South final in 2013. The Eagles will be hoping for an improvement on the offensive side of the ball, which was a challenge at times last winter. Junior point guard Shira Stoller, a three-year starter, is continuing to improve at limiting turnovers and looking for her own shot as well as setting up teammates. One of the players that benefits from Stoller’s ability to get into the lane is sophomore Emma Eberhardt, who was third on the team in points as a rookie and continues to develop into a consistent wing scorer. Sophomore Veronica Wallace has emerged as one of the top backcourt defenders during the preseason and is one of the fastest players on the Sharon roster. Senior Ana Crosby, who is also a standout on the soccer and lacrosse fields, is another player that is continuing to improve and will have an increased role this season. Freshman Kaitlyn Wallace is a newcomer to watch and could have a bigger role to play over the course of the year. The Black Knights lost six seniors to graduation but this offers plenty of opportunities for a new crop of younger players to get playing time and learn the system of second-year head coach, and former Stoughton star, Charmaine Steele Jordan. Two of the players that will be counted on most this season are junior forwards Val Whalen and Jordan Motley, who are two of the best rebounders in the league and can also get out on the break and score in transition. Their development in the half-court offense will be a key for Stoughton making a playoff push in the Davenport division this season. Senior Lili Njiem is another player that could make a big impact, as one of the team’s three captains. The Black Knights will have as many senior as freshmen on this year’s roster (three) along with four sophomores and three juniors, so the foundation for the future is in place. Shyanne Trinh, Lexi Baptista, and Aliyah Wright are the three newcomers to the program who will be hoping to make an instant impact. MILFORD, Mass. – Ordinarily, the bleachers behind the benches remain closed during volleyball matches, but as the beginning of the varsity match approached Milford athletic director Peter Boucher was forced to pull out an extra section to accommodate the overflow of fans, the majority of whom were decked out in pink. It was a special occasion for a special cause and the crowd piled into the gym at Milford High on Wednesday night to celebrate the volleyball team as it took on unbeaten Hopedale and to honor Dig Pink Night, which raised money for the Side Out Foundation’s mission of finding a cure for breast cancer and supporting breast cancer patients. With a raucous atmosphere spurring them on and inspired by teammate Carli Gonzalez and head coach Linda Zacchilli, who both beat cancer in the past year (Zacchilli for the second time), the Hawks played arguably their best match of the season to sweep Hopedale in three sets (25-14, 25-12, 25-12) and clinch a return to the state tournament. The Milford front line set the tone in the opening set. The Hawks dominated at the net, led by junior Kelley Reichert who recorded four of her team-high seven kills and two of her four blocks in the first. She also added a pair of aces and five digs in the match. Her back-to-back kills set up set point before a Hopedale error wrapped up the first. In the second set, the Hawks fell behind very early but behind strong serving from Gillian Valanzola (two aces) and Lauren Zouranjian (team-high three aces and eight assists) Milford took control and pulled away. Valanzola added five kills and was a strong presence in the middle alongside Juliana Tracy, who finished with a team-high six blocks. The third set was another dominating performance by Milford. The Hawks never took the foot off the gas and used a strong defensive effort to put pressure on Hopedale, forcing the visitors into a number of errors. Libero Kyra Alves spearheaded the defense with 14 digs to lead the Hawks. Last season’s Dig Pink event was particularly emotional because the girls took a moment to honor Zacchilli, who was then the boys’ volleyball coach and was battling cancer for a second time. Also, just days before the match, Gonzalez, then a freshman volleyball player, was diagnosed with cancer as well. Unlike last year, Zacchilli did not want the event to be about her battle. The team did honor the coach before the game privately with flowers in the locker room. As she did last year (and recently did at Fenway Park during the NESN/WEEI Jimmy Find Telethon), Gonzalez sang the national anthem in front of a packed house. Gonzalez has a new perspective on Dig Pink Night after her battle with cancer. “It’s so good to see everybody,” said Gonzalez after the match. “Everyone know someone with cancer, especially breast cancer, it’s so common. Gonzalez and Zacchilli stayed in touch over the summer with the coach making sure that her player would be part of the event and the team, whether on the court or at the scorer’s table. Zacchilli also contacted Hopedale coach Andrew Mainini to be part of Dig Pink. Mainini played volleyball at Milford for Zacchilli, was her assistant coach for several years and last spring took over the boys’ volleyball program with Zacchilli as his assistant. He jumped at the chance to be part of the event. He said, “I was honored when she called and said, ‘Hey Andy, do you want to be our Dig Pink match?’ It was meaningful for me, my girls and obviously we wanted to do everything we could to contribute to the cause. On Dig Pink Night, the game is always secondary to the cause, but this display gives Zacchilli confidence that the Hawks have the potential to make some noise in the playoffs. Milford (9-3) will put that to the test on Thursday, as the Hawks have a quick turn around to host Kelley-Rex division co-leader Mansfield. The Bombardiers are hoping to take a step forward and make a dent in the very competitive Kelley-Rex Division. Attleboro picked up a pair of non-league wins last season and is hoping that success can start to translate to league play. Head coach Lindsey McDonald noted the offseason work of juniors Lexi Pereira and Sarah Lynch. Both Pereira and Lynch will play as outside hitters and McDonald said she expects both to bring a lot of power to the attack. Liz Howe, a captain, will be in charge of getting the attack going from the setter position while captain Julya Carlson will anchor the defensive effort for the Bombardiers. Canton has had a dominant run in the Davenport division over the past six years and the Bulldogs are looking to continue that tradition in 2016. Canton has a dozen seniors on the team and will be relying on their experience and leadership to make another run at the division title and in the playoffs. Nicole Poole returns as a second year starter at setter and will be the catalyst for Canton’s offense. Emma Murphy and Casey Shea both have varsity experience and will be important pieces at the middle of the net. 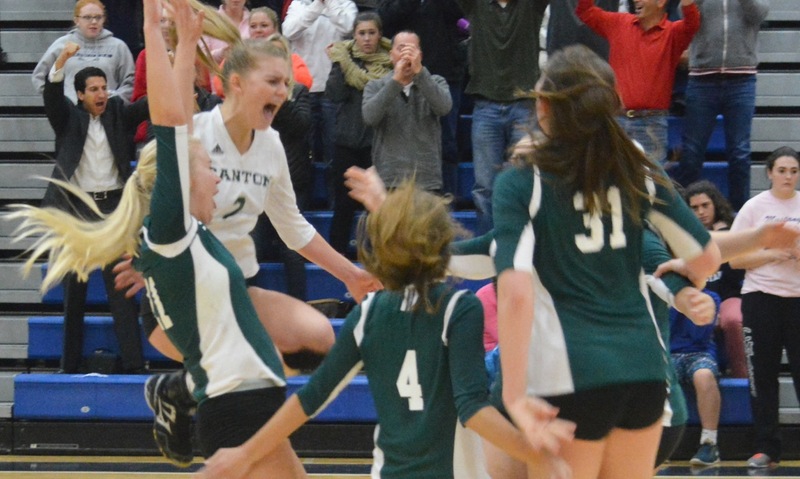 One spot that Canton has to fill is at outside hitter and the Bulldogs have a handful of players in the running including seniors Emma Gobbi, Erika Lum, Cassie Loftus, Kelsey Irons, Malia Claiborne and Maria Mackie. Canton is hoping for another year of strong defense with seniors Julia Panico, Kehla Minkin and Emily Lynch all vying for time in the back row. Foxboro is hoping its upward trajectory continues in 2016 after making great strides a season ago. Head coach Dan Damish and the Warriors will rely on its three senior captains – Lindsay Greer, Julia DiCenso and Julie Bridges – to continue to push the program in the right direction. DiCenso will be the starting setter for the fourth straight season and will have Danielle Conlon, the team’s leader in kills last season, at her disposal. DiCenso will also have Greer, Bridges, Ana Sanchez and Molly Crocker as offensive options. Junior Delya Lorquet could emerge as a big threat as a middle hitter as well for Foxboro this season. Coming off the program’s second Kelley-Rex division title in the past five seasons, Franklin will be relying on youth to stay near the top of arguably the most competitive division in all of the Hockomock League’s sports. Senior Erin Skidmore (28 kills in 2015) is making the transition from the middle to the outside and will be a go-to attacking option at the net. At 6’3, junior Meaghan Maguire saw valuable time last year and will be a defensive leader at the net. The Panthers will look to sophomore setter Lauren McGrath to step in to set up the offense. King Philip had another strong campaign a year ago and are looking to repeat it in 2016. The Warriors have six returning seniors and all are expected to play important roles for KP this season. Senior captain Carly Adams will set the offense in motion from the setter position, senior captain Emma Lopez will be a key piece in the attack from the outside hitter spot and senior captain Angela Vellante will be a defensive specialist in the back row for KP. Senior Amanda Loewen will also be a key piece to the defense as the team’s libero. Senior Liv Balduf will help balance the offense as a rightside hitter while Molly Croke will help bolster the team’s defense. Junior Sydney Phillips, another returner from last year’s squad, will be an attacking option as an outside hitter. The Hornets will look to follow up a historic one with another strong showing and they have some experienced players to do so. It will start with defense for Mansfield, who return one of the top liberos in Jess Haradon and one of the top middle blockers in Meg Hill, the 2015 HockomockSports.com Underclassman of the Year. Mansfield will have to replace some key pieces but senior Chloe Peters will be tasked with setting up the offense while junior Julia Harrison, who saw some minutes as a sophomore a year ago, will be one of the Hornets’ outside hitters. 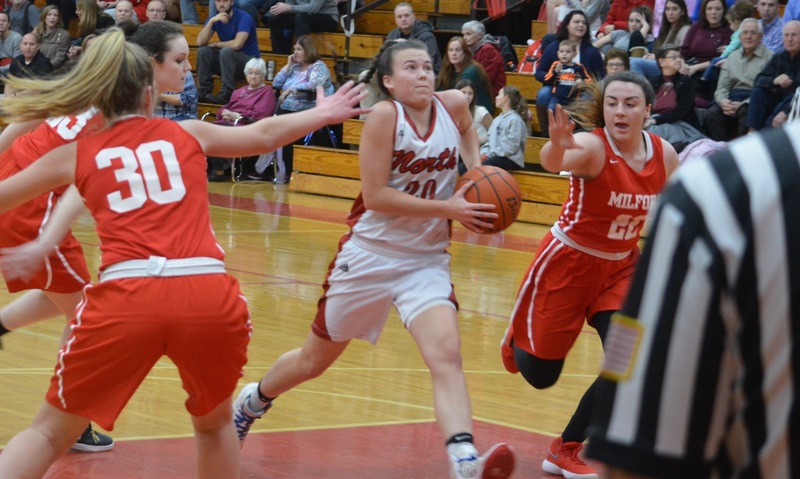 The Scarlet Hawks just missed out on the playoffs a season ago but with Linda Zacchilli back on the bench, Milford could be right in the mix for the Davenport title. Offensively, Milford will need some need faces to step up after its top three kills leaders graduated. Junior Kelley Reichert is back after 66 kills last season and senior Stefani Chiarelli and junior Juliana Tracy will both factor into the offense as well. Both of Milford’s setters – Lauren Zouranjian (301 assists) and Allie Collins (198) – are back for 2016, which should help the Scarlet Hawks’ offense flow. Libero Kyra Alves is back after being a strong point in the defense last year as well. The 2016 season will be a bit different for North Attleboro compared to a year ago. The Red Rocketeers now compete in the Davenport division and their attack has been bolstered by the addition of Amelia Murphy. Murphy was a top offensive player in the league a year ago at KP but has since transferred to North Attleboro. Murphy will be an attacking option along with junior Katie DeMontigny (100 kills last season) and Tori Melanson, who will also be a presence defensively at the net (82 kills, 70 blocks in 2015). North Attleboro will need to fill in the role of setter with Taylin Shultz graduated. Gabby Duva and Lindsay Howlett will be two key defensive players for the Rocketeers this season. Oliver Ames has a strong mix of experienced players returning this Fall and are looking to take a trip back to the postseason after missing out in 2015. Senior captain Bridget McCarthy, in her fourth year on varsity, returns as the starting setter while fellow captain Alyssa Gavin returns as a top defensive option in the back row along with Rachel Foley. Junior Emma Petrillo will be one offensive option for the Tigers as an outside hitter, junior Katherine Flynn will be another as a right side hitter. Juniors Maya Fetcho and Kayla Raymond will rotate as offensive threats from the middle of the net while sophomore Sadie Homer will be the Tigers’ starting libero this season. Other names to keep an eye on include juniors Caroline Cavanaugh, Jacqueline Kander and freshmen Allison Kemp and Jordyn Vella. “If we commit to it, I think we can rise to many challenges, prepare for all possibilities, and make the most of everything,” head coach Chelsea Correia. New head coach Andrea Lovett is excited about the direction the Sharon volleyball program is headed and is hoping 2016 will be the first step in the right direction. Senior captain Faythe Gomolka returns this year as this the team’s versatile setter and has a great rapport with senior captain and middle hitter Natalie Kane. Seniors Marni Heitin, Luba Korn, Gesi Molla and Jonathan Dickerman will all factor in for the Eagles this season as well. Junior Jess Allan, now in her third year on varsity, will be an attacking option as an outside hitter while classmate Cori Jermyn will be an attacking option from the right side. “As a new head coach, I am excited to work with the team on developing a more aggressive mindset and working on some more complex offensive systems to raise our level of play and be competitive in the league this year,” Lovett said. The Black Knights had a handful of talented players graduated from last year’s team but there is hope for optimism because of who is back this year. Stoughton’s kills leader junior Val Whalen is back for her third year of varsity after registering 129 kills a season ago. Junior Jordan Motley and senior Riley Bagley will also be big pieces of Stoughton’s attack this season after slamming 84 and 77 kills, respectively, in 2015. The biggest challenge for Stoughton will be finding players to step up in other areas. The team’s ace and assists leader from last season, Bianca DeSousa, the team’s leader in blocks and digs, Bridget Whalen, and the team’s leader in serve receives, Ava Siegel, all graduated. First year head coach Erica Batchelder will be looking to players to step up into those roles. Taunton turned a successful regular season and a fourth place finish in the Kelley-Rex into one of the more memorable seasons in Tigers’ history. Taunton made a run all the way to the D1 South Final before falling to eventual state champion Barnstable. It will be a tough task to repeat with the amount of players that Taunton graduated, but the Tigers are up for the challenge. Taunton will need a new setter to step up after graduating Tatum Speicher, one of the top in the area at the position. Offensively, Emily Moor (team-high 254 kills in 2015) is back for her senior season while junior Sam Reaume (69 kills), senior Abby Waldron (69 kills) and senior Delaney Powell (26 kills) are all back after making an impact at the net a season ago. 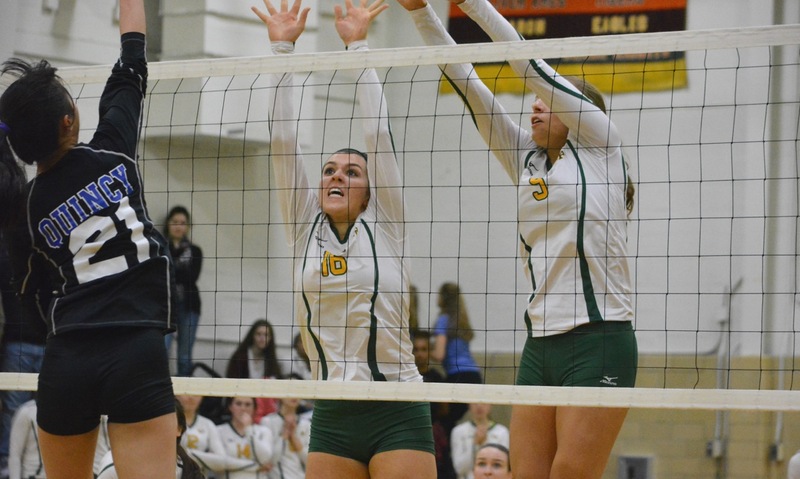 Carly Adams, King Philip – King Philip was a dangerous attacking team a season ago and Adams, the team’s setter, was the big reason why. Adams will be a catalyst in getting the Warriors’ offense going this season. Julia DiCenso, Foxboro – There aren’t many players in the league with the experience that DiCenso has. Now a senior captain, DiCenso is in her fourth year as the starting setter for the Warriors and will be a key piece of the offense this season. Jess Haradon, Mansfield – Haradon really impressed defensively in her first year on varsity and looks to do the same in 2016. The senior will look to continue as a defensive specialist after leading Mansfield with 264 digs a season ago. Meg Hill, Mansfield – As just a sophomore, Hill led the Hornets in kills (222), and blocks (74). Now a year older, expect another strong attacking year at the net for the 2015 HockomockSports.com Underclassman of the Year. Bridget McCarthy, Oliver Ames – McCarthy is another four year varsity player and will likely eclipse a setting milestone this season. OA has a handful of young attacking options but things will be easier for them with McCarthy as the setter. Emily Moor, Taunton – Moor had the most kills in 2015 for players returning this season, which is good news for Taunton. As the Tigers look for new names to emerge in other spots, they can rely on the consistent offense of Moor. Amelia Murphy, North Attleboro –North Attleboro graduated a great attacking threat in Sara Youssef but now have KP transfer Amelia Murphy at the net. Murphy has the ability to hit around the block, which is very difficult for defenses. Nicole Poole, Canton Canton has been the team to beat in the Hock for a good stretch now, including last season with Poole setting up the offense. Canton will need new names to step up as attacking options but having Poole as the setter will make things easier. Erin Skidmore, Franklin – Franklin is in need of some players to step up as attacking options and Skidmore is looking to be one option as she moves from the middle to the outside. The Panthers have a good balance this year and Skidmore looks to be one of their top attacking options. Val Whalen, Stoughton – The junior returns after leading the Black Knights in kills a year ago. If the Black Knights can find a replacement at setter, Whalen could be a tough player to stop this season. MILFORD, Mass. – Both the Milford Scarlet Hawks and the Sharon Eagles entered Monday night’s contest with similar goals in mind. Milford entered the game off of a close and exciting win against border rival Hopedale and was looking to keep momentum in its direction. Sharon entered with the same goal, winning the past two games at its own holiday tournament over winter break and looking to get back to .500 for the season. It was the Eagles that came out on top in the divisional matchup, defeating the Hawks 39-31. Senior Charlotte Ransom and freshman Emma Eberhardt tied with for the team-high 11 points apiece and senior Alyssa Piazza added 10 for the Eagles. The game, however, did not begin in Sharon’s favor. In the first 2-1/2 minutes of play, Milford held a 6-1 lead. “We started off with a man press, full court, it wasn’t really working to our advantage in the first quarter,” said Sharon coach Cliff Tomassian. In fact, Sharon scored more points via free throws than field goals, while committing only one foul of its own in the first quarter. At the end of the first quarter, Milford led Sharon 10-5. Sophomores Juliana Tracy and Kate Irwin dominated the quarter, with Irwin scoring six points and Tracy scoring four. Milford, however, could not keep its lead. Sharon began the second quarter on a 3-0 run, and held Milford without a point for the majority of the quarter. Sharon committed just one foul in the second quarter, while also scoring 14 points. Milford, on the other hand, committed five fouls, and were limited to just three points in the entirety of the second. Milford’s top scorer for the night was sophomore Kate Irwin with 11 points. The Hawks’ top rebounders were sophomore Juliana Tracy and junior Nicole Dahlgren, tallying seven apiece. 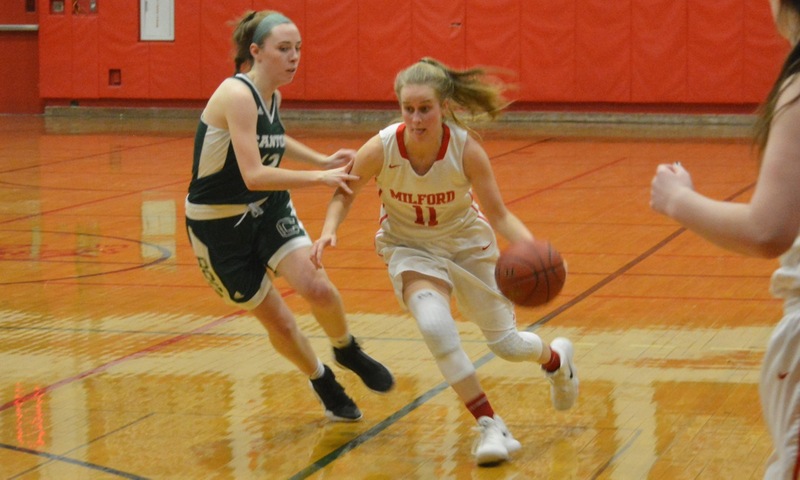 Milford (4-3, 1-3) returns to the court on Friday at home against Foxboro and Sharon (3-3, 1-3) travels to Oliver Ames that night.